2.25x10 Wicker Brushed Nickel Floor Register Discounts Apply ! These satin nickel floor registers are available in a unique wicker design. These are more than just a decorative register they are made with a sturdy steel core. 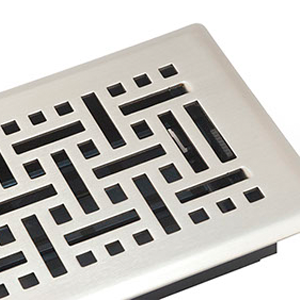 Your satin nickel floor registers have a premium tarnish resistant finish. 2.25 x 10 decorative registers offer both great quality and design. This satin nickel floor register has a built-in sturdy plastic damper that can open and close. Decorative registers are a great way to update the look of your home or office. ***Hint: The industry standard is to order using the actual hole opening size and not the faceplate size. This satin nickel floor register will fit a 2.25 x 10 inch hole opening. Actual Damper Dimensions: 2 1/4 inches x 9 7/8 inches. 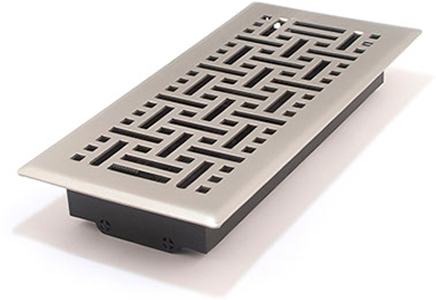 These satin nickel floor registers will give your home a modern updated look. Place your order today!